Description: A maximum of 7 gates can produce an awesome wave or a mighty big hole. 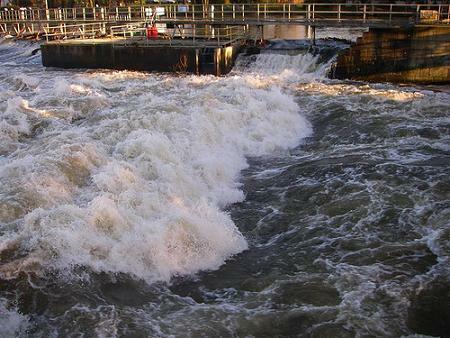 This weir is almost as unpredictable as Shepperton and the conditions or type of feature created can change very quickly. When the Feature is at its best it creates a big powerful wave but just behind this is a very unstable retentive hole, so be prepared to get a short lived kicking as you come off the back of the main wave. Hazards: This weir can be pretty nasty at some levels, so be careful make your own judgement, you will have to Paddle down to have a look! The weir sill is generally shallow enough to re-shape the front of your boat. Do not ever get out in the gardens down stream from the weir. Directions: Coming from outside London, exit the M25 Junction 11. Follow the signs to Chertsey. At the T junction (second set of traffic lights) turn right towards Shepperton. Follow the road passed an esso garage (on your right), to which you come to a roundabout that you need to go straight on as if you are driving to whitewater the canoe centre, drive past the turning for whitewater the canoe centre (on your right), in approx half a mile turn right just after willow way (on your right) and park in the public car park. Walk across the field to the river and put in to paddle down stream towards the weir. As you get to the end of the river right bank you will see the weir on the right hand side.